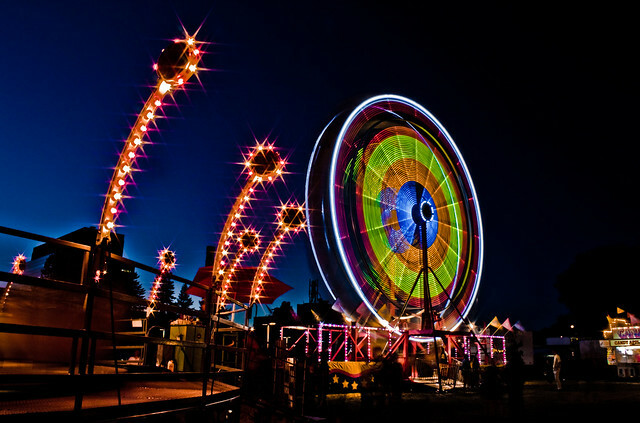 The Ferris Wheel | Flickr - Photo Sharing! There was a piece of lens flare here, I didn't remove it perfectly. A long exposure of a moving ferris wheel. I just started using Google+ and its a great place to show your work and find great photographers, here's an invite. I shot this on a tripod, using a polarizing filter to make the sky a darker blue to contrast the bright lights, and a 2 Sec. selftimer. I like the diffraction stars created by the small aperture that I used. I opened the RAW file in ACR and used a new preset I made to give an image a slight HDR feel by increasing the contrast and recovering the highlights and adding detail to the shadows. Pretty well it increases the fill light and recovery sliders, then compensates for lack of contrast by increasing the blacks. The detail is added by the clarity slider and the tone curve is manipulated to tune the global contrast of the image. Since I agressively increased the contrast of the image I decreased the saturation and increased the vibrance to compensate and tweaked each colour's hue to make them look the way I wanted. I opened the RAW file in CS4 and blended it using luminousity blending mode with another layer that didn't have the ACR adjustments that I had done, I lowered the layer's opacity to control the HDR-like effects to the image and removed some of the annoying halos around the shadow areas. I used the patch tool to remove a large pole to the left of the frame and finished it off with the cloning tool. I cropped the bottom of the frame slightly to remove a boring portion of the image. At the end I saved a 16 bit TIFF file, converted to sRGB colourspace and saved as a JPEG to upload to the internet. .Mike Schmidt., Maxime Bermond, and 568 other people added this photo to their favorites. would you mind checking out my flickr page? I am a beginner, so don't be to harsh ;). haha. I would love for you to leave a comment. a like the way light create this awsome enviroment! GREAT PIC! Wow! awesome picture, beautiful colors!